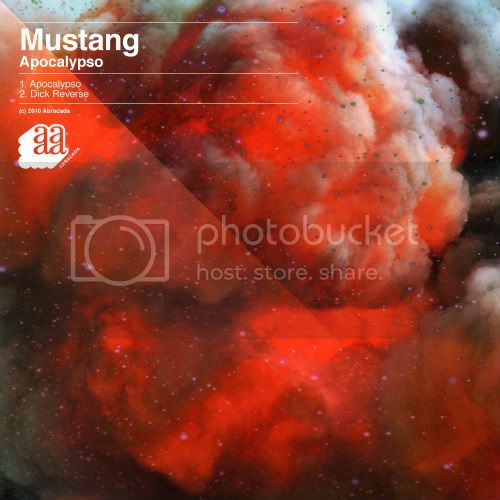 Following the recent release of the inaugural Villa – ‘Beats Of Love Remixes’ EP on Abracada, Belgian production duo Mustang step up with their inimitable nu-disco sound on the brilliant ‘Apocalypso EP’ for the label. Mustang is a brand new collaboration between veteran DJ Renaud Deru (aka Cosy Mozzy) & newcomer Andy Faisca, the studio wizard! Renaud built his career as co-owner, resident DJ and artistic director of the infamous Dirty Dancing Club in Brussels. Both have the same musical obsession for [bItalo Disco, Early House & Classic Pop music[/b]. Mid 2009, they started to work together in the studio and have since done remixes for Vitalic, Ghinzu, Poni Hoax, Primary1, Silvervince, Casey Spooner and Two Door Cinema Club, amongst others. They released their first EP, “Chameleon”, on Gomma Records, Germany early February of 2010. They became a DJ duo & main residents at Renaud’s new hang out “Libertine Supersport”, which is definitely THE place to be in Belgium. They are now set to release the follow up EP for the brand new Abracada label. The future looks bright! The future is Mustang!!! *The EP will be available everywhere else from 13th December! To celebrate the release of the ‘Apocalypso’ EP, they are giving away a remix of the title track for download.